If you have recently installed the new Windows 8 operating system and enjoying the modern tile-based interface, there must be few things that are still not completely under your control. You still have some tweaks to do to make the new Windows 8 more useful and productive. If you have installed too many modern apps and the live tiles are updating itself, sometimes you will be in a situation that every live tile is updating itself and you don't know which one to see. If you have tried many apps and then uninstalled it for any reason, the credentials are still there in Windows credential manager. There are many such things, very small but still useful and important to make your experience great. As said above, have you installed too may Metro applications and now every application live tile is updating itself. You may enjoy this, but when it is too much, you may want to stop that. You can easily and selectively stop/start the live update of tiles. Just right click on the particular tile you want to stop live update, and select 'Turn Live Tiles On / Off' option from the bottom options bar. At the same time, you can change the file size, a regular larger sized rectangle tile or a small square tile. Note that this option is available only for the apps that are installed via Windows Store. Now, If you have tried many windows Modern applications randomly and then installed them for any reason, but if you have used them for logging in to an online service like the Twitter account, email or anything like that, your user ID and password are still there and you have to delete them manually. Read this post for more details. If you are using an evaluation copy of Windows 8 and you have still not activated it and you have some time for activation, but the Windows will ask you for activation and display a watermark on the right bottom which may annoy you. You can easily remove it. 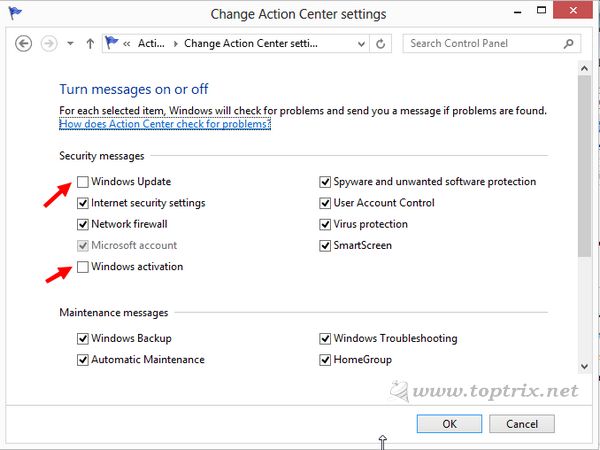 Goto Settings >> Control Panel >> System and Security >> Action Center >> and then click on 'Change action center settings' link on the left side column. Under the 'Turn messages on or off >> Security massages' category, de-select the option 'Windows Activation'. You have to restart your computer to see the effect. Similarly, you can also turn off the notification messages for 'smart screen filter', low storage space warnings, Windows backup and other. Do you like the 'fast boot' father of Windows 8 that drastically reduces the bootup time of your computer? If you do, you should be aware that it has its own problems. If you are using Windows 8 on a tablet, it is fine but if you are using it on a desktop, I will recommend you to turn off the 'fast boot' feature. When you keep the fast boot ON, Windows does not check for the hard drive errors on next boot and you may get errors while using it. If you don't shut down your computer in a proper way, you should turn off the 'Fast boot' feature. Read this post for turning it off. If children use your computer at home and you cannot always monitor what they browser over the Internet, Windows 8 will take care of that. Windows 8 comes with the built-in family safety feature. You just have to activate the family safety feature for the existing child account or if there is no child account, you should create a new account and then select the option 'Is this a child's account? 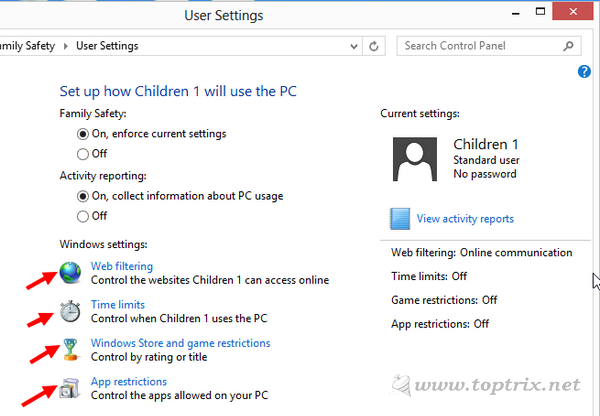 Turn on Family Safety to get reports of their PC use' while you create a new user account. Once created, you can apply settings like web filtering, time limits, application restrictions and game restriction downloads from Windows store. To activate family safety feature got to control panel >> user accounts and family safety >> click on family safety. You can either create an account with a Microsoft ID or a local account. You can set the web content filter level, which website to allow and which to block, block file downloading, allow or block a specific website, same is the case with application and games. Have you ever played the basic Windows games like Solitaire and minesweeper over the internet? Have you ever used the XPS document viewer? Probably not. Then why keep them in the system. You can easily remove such unwanted and never used features. Go to Control Panel >> Programs >> Programs and features >> click on 'Turn Windows features On or Off' link on the left bar. There are many Windows modern apps available in the market that provide you location-based service that tracks your location and provide you customized services. For example, if you have NOT allowed the location tracking, Weather App will not show you the weather of your correct location and when you allow the location tracking, it will correctly display your current location's weather by default. If you do not want to get such, you can turn off your location tracking. It also affects your Application access in Windows Market. Go to Control Panel >> Location Settings and de-select 'Turn on the Windows location platform'. You can easily find out the amount of hard disk space any particular application is using in the traditional desktop space. There is a special column in 'Add or remove software'. But how you determine the installation size of the modern metro application? The option is deeply buried in the Windows settings. 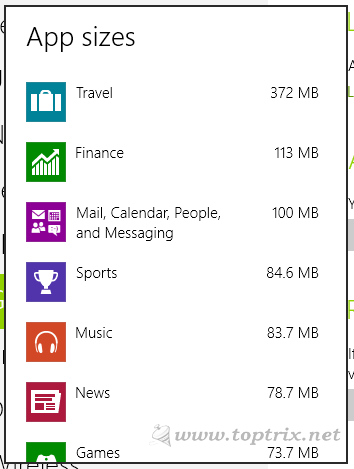 Go to Settings >> PC Settings >> General >> Available storage and click on the button 'View App sizes'. It will take some time to calculate the space acquired by every application, wait and you will easily get the total space used by every Windows 8 modern metro application. You can arrange the tiles in start screen to different groups as you want and then give a better suitable name to it. 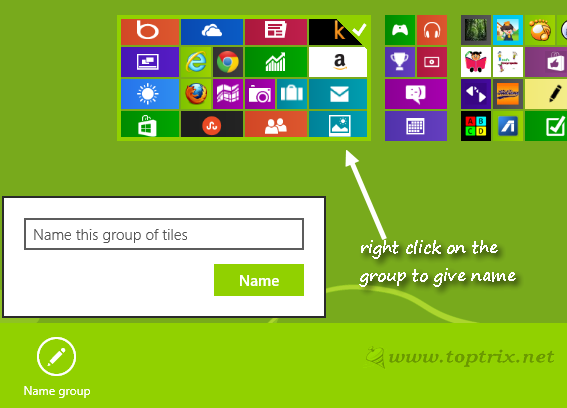 To give a name to any tiles group, click on the '-' sign at right bottom in the start screen. The tiles will go into editing mode. Now 'Right click' on the group of tiles you want to rename. An option to give name will be shown at the right bottom of the screen. Click the button and the dialogue for giving a custom name will open. Enter the desired name and save it. You are done. 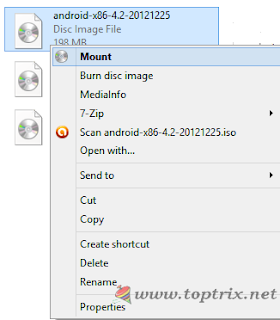 You do not need to install any third party application like to run disk image formats like ISO or NRG. Windows 8 has it built in. 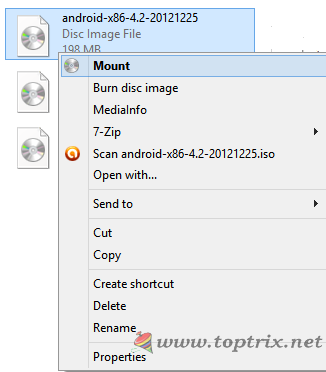 You just have to right-click on the disk image file and you will get the 'Mount' option. Mount the disk image and it will run as if you are running a CD from CD drive of your computer. In previous versions, if you want to capture the screen, you have to press 'print screen' button and then copy paste it into Paint. Windows 7 also has a 'Clipping tool' to make that easy but now Windows 8 have a hotkey function to capture the working screen. Just press 'Windows key + Print Screen' buttons combination. All the screenshots will be saved in 'screenshots' folder inside My Images folder.